Mamamia Hostel and Guesthouse i Palermo, Italia: Bestill nå! The Group can delete the reservation until onde week before. After this tram i pick-up the interal price of the first night. Please tell me the arrival time. Mamamia Property and Guesthouse is the structure you were looking for your trip to Sicily! The Guesthouse offers the possibility of different types of accommodation . The palace of Mamamia, built around 1900 by the family Biondo and therefore has the classic characteristics of a stately, high ceilings and thick walls combined to the modern and functional will guarantee peace and tranquility. We offer free WiFi, air conditioning, bar, 24 hours reception. The breakfast is included. 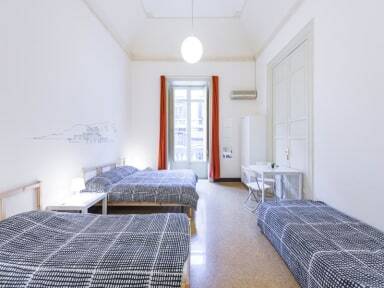 Mamamia Property and Guesthouse is located in Palermo,to 10-minute walk from Palermo Centrale Train Station. Falcone-Borsellino Airport is 31 km away and the property is close to the Cathedral (10 minutes walking) and the other monument of the city. Mamamia Property and Guesthouse has 8 rooms. Each room will provide you with a desk. The private or shared bathroom includes a hairdryer, and most are equipped with free toiletries. Check in from 10:00 to 22:00 .